10:30 am-12:15 pm - Satsang with Swami Nirmalananda. Please enjoy our free library of online recordings of past satsangs. This free meditation program features a discourse by Swamiji, followed by a group chant and meditation, including meditation instruction. Bring your meditation journal or pick one up in our shop. Check our calendar for dates. Enjoy our free online library of recordings of Swamiji's discourses from past satsangs. Join us for our early morning chant of this Sanskrit text, done daily in Svaroopa® Vidya Ashram. 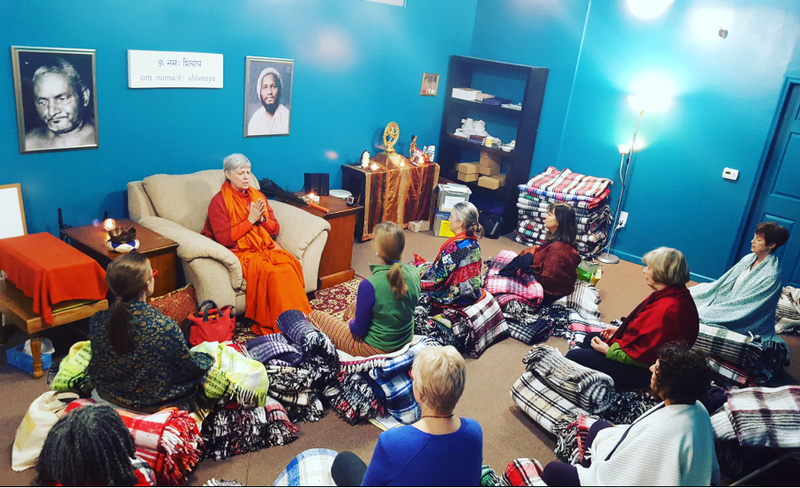 Swamiji brings it to Downingtown Yoga one Thursday each month, as well as on Swami Sundays. The meditation following the chant is always particularly powerful! Check our calendar for dates. Find out the deeper meaning and learn the pronunciation here. Discover how easy meditation can be in this one-hour intro. Instead of watching your mind, dive deeper within by using the shortcuts that yogis specialize in. Named Svaroopa® Vidya, this meditation methodology is based in yoga’s tantric system. In one hour you will learn the goal and purpose of meditation as well as the how-to basics. You can ask your questions and be ready to add meditation to your lifestyle. Tuition: FREE. Click for dates & to register. Swamiji gives us what her Guru gave her, a tried-and-true path. She knows that it works because it is the path she took. She knows the whole process and guides us through it - for free!